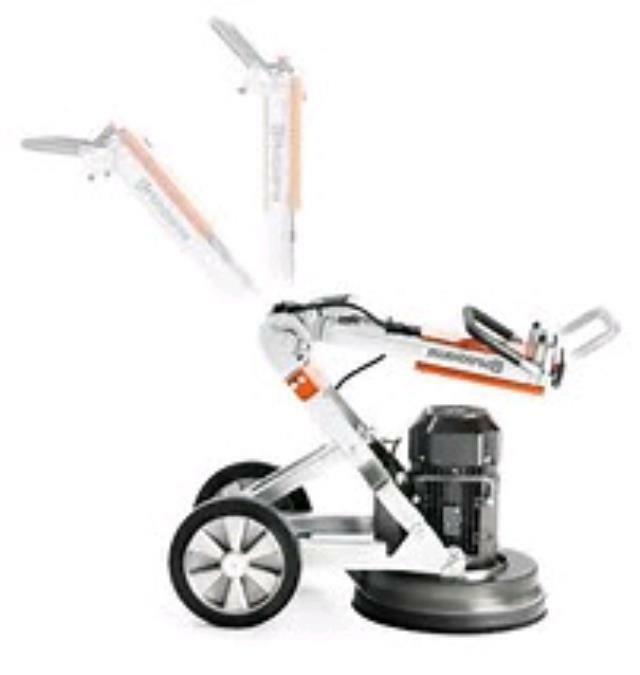 Husqvarna's PG 280 12" Electric Direct Drive Edger Grinder With Quick Change Multi-Accessory Disc Is A Powerful Portable 115 Volt Surface Preparation Machine. Perfect For Grinding Adhesive Residue, Paint and Spackle On Small-Medium Concrete Areas. A Removable Section (Right Or Left) On The Lid Cover Makes It Easy To Convert To Edge Grinding. The 150lb Grinder Head Removes Quickly From The Operating Dolly For Easy Transporting. Rental Fee Does Not Include Dust Collection Vacuum Or Accessory Sets For Grinding Or Polishing Which is Rented Separately. Use Redi Lock Diamond Tool Sets For General Grinding, Removing Rain Or Trowel Marks, And Rough Uneven Surfaces On Concrete, Terrazzo And Other Stone Surfaces. Husqvarna Hiperfloor Floor Treatment Products Can Be Added To Improve The Finish And Gloss Of The Polished Floors. Husqvarna Hiperhard Will Increase Surface Hardness & Create A Crystalline/Glassey Structure For Gloss, Abrasion Resistance And Greatly Affects The Final Appearance Of The Floor. Husqvarna Hiperguard Is A Premium Grade Surface Impregnator Used To Seal, Simplify Maintenance, Extend The Lifespan And Enhance The Color Or The Materiel Being Sealed. Note: Concrete Grinding/Polishing Is A Very Time Consuming Project Requiring Many Hours And Great Patience To Properly Complete Each Step Required For High Quality Polished Surfaces. * Please call us for any questions on our concrete grinder 12 inch pg280 120v rentals in Portland OR, Gresham OR, Milwaukee OR, and surrounding metro area.